If you are a carpenter or a craftsman, the circular is one of the essential items in your toolkit. With the best worm drive saw, you will be able to make clean and precise cuts, on different materials. All you need to do is know how to make the settings and adjustments and you will be good to go. As a safety measure, it is important to familiarize yourself with the saw and all the features, of the model that you are using. You should wear protective clothing as well when using the saw. In this guide, we will teach you how to use the saw as an expert. 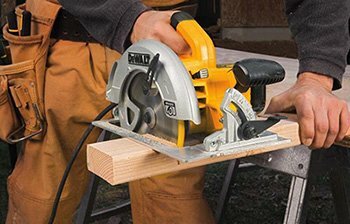 How to use a circular saw safely? 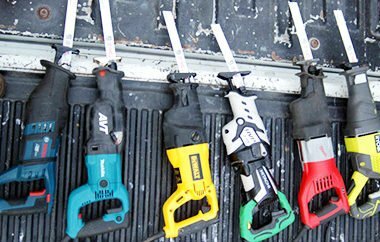 It is important to reinstate that there are so many different models of circular saws on the market. This is why you will need to familiarize with the features of the one that you have. Be sure that you have the right blade for the task at hand. Do a quick check on all features to ensure that they are working efficiently. As part of the preparation, you need to wear eye protection and gloves while working. Find thick gloves that will protect your hands. If you have a project that will take a long time, you need to wear ear muffs as well to protect your ears. A dust mask is also useful, as it will prevent any cases of inhaling saw dust. You should also wear fitting clothing and prevent any loose clothing or accessories that are not fitting. Measure and placemarks on the areas that you will be making your cuts. You can use a pencil and a straight edge or a simple ruler. Place a mark on each place that you wish the saw to make cuts. This marks will serve as your guide and visual aid when you are operating the so. As such, you need to make sure that they are visible and clear. Place your workpiece on the saw table or can choose to use 2 sawhorses. You should ensure that your material is perfectly supported and that there are no obstructions beneath it. As such, you do not have to worry about your blade having to pass over some foreign objects. Never make the mistake of placing your material on a standard bench, table or on the floor. This could cause serious damages on both the work surface and the blade of the saw. Sawhorses in different sizes and can be found at the local hardware. You can now set the blade to the desired cutting depth. This is will be done using the central lever. Pull the shoe lever that is between the two handles, all the way down. This will disengage the baseplate and will make it move without freely. Place the baseplate against your materials and raise or lower the blade to your desired level. It is advisable to set the blade 1/8 inch to a ¼ inch below the bottom of the material. When you set it too deep, you will be forced to work harder and have more teeth exposed. If you are intending to make beveled cuts, you need to adjust the pivoting scale so as to angle the blade. Twist the knob that is on the front end of the circular saw in the counterclockwise direction. This will unlock the scale and then you can slide it to one of the preset angles that are on the frame. You can also stop it on any point so as to make custom cuts. Once you have achieved the desired angle, you can turn the knob clockwise so as to be able to lock the scale in place. Start by positioning the line on the baseplate over the cut line. On the front part of the baseplate, there is a small notch that has a bold line on both sides. On the left side, it is labelled 0, which corresponds to the position of the blade, when it is set to 90 degrees. This should be used for all normal cuts. On the right side, this is labelled 45 and will be used for making angled cuts. Pull the trigger in the rear handle to turn on the saw. 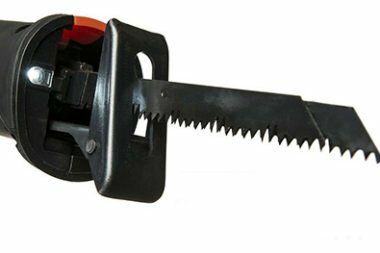 In other models, you will find a safety trigger, which is near the top part of the saw and this need to be flipped, before you can start the saw. When you pull the trigger, the blade will start to spin and you should allow it to spin to full speed before making any cuts. If you use the right hand, it will be comfortable to handle the saw at the rear with the right hand, while your left hand would be on the front handle. This will give you additional stability for clean and precise cuts. If you are left-handed, do the reverse. You should only pull the trigger when you have double checked your measurements and the baseplate is properly aligned. With the saw blade rotating at full speeds, you should push it slowly and smoothly along the surface of the workpiece. Use both hands to move the saw, so as to stay aligned to the cut line. You should avoid forcing the saw when making your cuts, instead, you should move it gently and in a natural manner. In most circular saws, the blade guard will retract automatically as you move the saw forward and lower. However, you can also pull it back manually to get it out of your way. Do not move the saw too quickly as this will result in mistakes and may also jam the blade. SAFETY TIP: Always keep your hands away from the blade at all times, when operating the saw. If you need to make any adjustments, take your finger off the saw trigger, completely. After you have done each cut, you should release the trigger so as to stop the blade. This should be a habit after each cut as it is also a safety measure. When you release the trigger, you should allow the blade to come to a complete stop. Your finger should be completely off the trigger, as you may accidentally start the blade while reviewing the work and end up with serious injuries. You should never compromise on this, as you do not want to risk any mishaps. When you are done using the saw, unplug it from the power sourced. Confirm that the blade guard is locked in its downward position and remove the plug from the power outlet. Wrap the power cord neatly, around the handle and keep it away. Allow the blade to spin at full speeds before you can start the cutting process. Inspect your workpiece to ensure that there are no objects or knots that may damage your blade and saw. 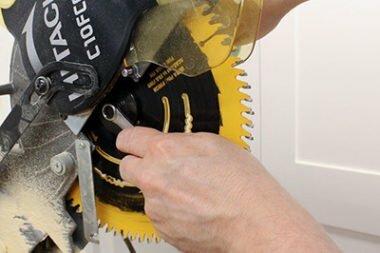 For all adjustments and changes on the blade, you should ensure that the saw is disconnected from the power source. Wear protective clothing including safety goggles, gloves and ear protection when using the saw. 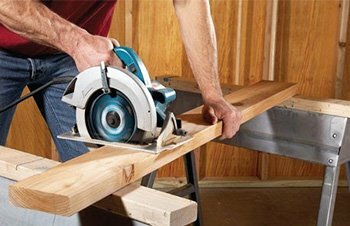 Never use the circular saw when intoxicated or under the influence of any substance. The circular saw is an exceptional tool to have and when you use it correctly you will produce amazing results. Follow this guide and you will be able to use the saw like an expert. Anytime you store your saw, ensure that it is on a flat surface and the blade should be facing away from any objects. All the best in using the circular saw in your next project.